The Cliburn: 50 Years of Gold premiered Friday, September 28, 2012. Every four years the best young pianists perform to see if they can win the Cliburn. Every four years, a group of the finest young pianists takes the stage at the Van Cliburn International Piano Competition in Fort Worth, Texas. In the midst of the drama, the beauty, the nerves and the excitement, they know one thing is true — what happens there can change their lives. They strive to feel the joy of victory and achieve their utmost goal: to become a performer on the world stage. 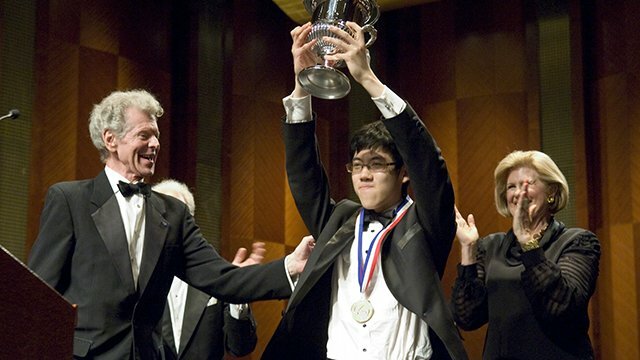 Haochen Zhang, a Van Cliburn winner at 19. Seen through the eyes and memories of 15 gold medalists, The Cliburn: 50 Years of Gold follows the half-century-long history of one of the world's most prestigious music competitions, set against the backdrop of beautiful music. Walking onto the stage at the Van Cliburn International Piano Competition is a critical moment in the life of a young pianist. Gut-wrenching drama, strung-out nerves and the joy of victory are elements that make up this extraordinary film retrospective. It was the height of the Cold War in 1958 when a young Texan named Van Cliburn became the winner of the first International Tchaikovsky Piano Competition in Moscow. The judges of the Moscow competition were the greatest musicians of the Soviet Union. Upon his return to the U.S., the 23-year-old Cliburn was given a ticker-tape parade in New York City, the only classical musician ever so honored. His album of Tchaikovsky's Piano Concerto No. 1, one of the pieces he performed in Moscow, became the first classical recording to sell a million copies. Cliburn's mother, Rildia Bee O'Bryan Cliburn, was trained at the Juilliard School in New York, and began teaching her son when he was age three. He spent most of his childhood in Texas; at age 17, he went to Julliard. Six years later, Cliburn was the most famous pianist in the world. He was inducted into the American Classical Music Hall of Fame, and has received the Kennedy Center Honors Medallion and the Presidential Medal of Freedom, among many other awards. The Van Cliburn International Piano Competition, held every four years, was started in 1962 to nurture the development of young artists. KERA is the presenting station for The Cliburn: 50 Years of Gold. KERA is a not-for-profit public media organization that serves the people of North Texas. The station broadcasts to the fourth-largest population area in the United States. KERA produces original multimedia content, carries the best in national and international public television and radio programs, and provides online resources at www.kera.org. The station’s extensive coverage of the arts can be found at www.artandseek.org. KERA-TV broadcasts on Channel 13.1. KERA WORLD broadcasts on 13.2. KERA-FM broadcasts on 90.1 in Dallas/Fort Worth/Denton, 88.3 in Wichita Falls, 100.1 in Tyler and 99.3 in Sherman. KXT 91.7 FM, KERA’s new music station, KXT 91.7, is streamed online. The Cliburn: 50 Years of Gold was produced by Peter Rosen Productions, Inc. and presented by KERA TV in North Texas.